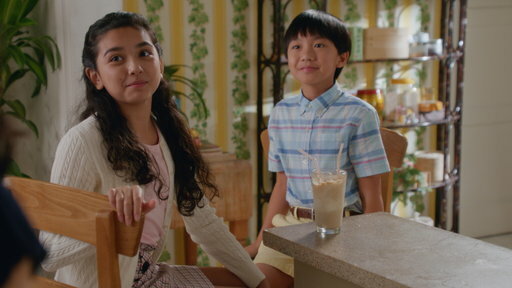 From Evan growing up to Eddie taking on responsibility driving and Louis turning the big 40, it's just another hilarious time on Fresh Off the Boat. Here's a recap! When Evan is given a note from a girl asking if he likes her or not; but when Jessica learns about it, she does what she can do to stop her youngest child from growing up. Jessica tries to bring down Evan by fixing his grade from an A to an A-. But after talking with Louis, Jessica fixed it by setting up Evan with his girlfriend at the pottery shop. "You've Got a Girlfriend" was a good episode. I very much enjoyed watching the story between Jessica and Evan as a mother is realizing that her youngest is growing up. It was a bit of a shock to see someone hating You've Got Mail as it's one of the best rom-com movies of all time. It played out well. The episode had good character development and writing. Overall, I give this episode an 8/10. "Driver's Eddie 2: Orlando Drift"
When Eddie gets his driver's license, Jessica makes sure that driving is a privilege and not all for fun and games. With a lot of stuff to do, Jessica gives Eddie the opportunity to prove that he can do all of her daily chores and still have time for fun. Not having a lot of fun, Eddie decides to not follow and go with his friends to the concert but realizes that he's getting responsible and apologizes to Jessica. Meanwhile, Louis tries to hang out with Marvin by taking him out to the chili con, but Marvin wasn't too excited to go and Honey comes along too. A disappointed Louis learns the real reason why Marvin isn't too thrill eating chili; he's got a health issue with digesting certain foods like beans and seeds. The two makes up and eats chili without beans. "Driver's Eddie 2: Orlando Drift" was another good episode. It holds up pretty good with its good character development. The Jessica and Eddie and Louis and Marvin story plot were good and not bested one another. Overall, I give this episode an 8/10. It's Louis's 40th birthday and all he wants is to have fun and a good time. But the boys don't want to have to do something that Louis was hoping for: camping. Instead, they get him to have a birthday party and that didn't sit well with Jessica as she had to find a gift that means something to Louis. From going through Louis's party plan book to learning have to dance, the boys stop Louis's excitement. After Jessica learns about what had happened; they did the one thing that will help it all: watch Legends of the Fall. They got the perfect idea for Louis to give him the Legends of the Fall camping trip in the backyard. And boy, wasn't he excited. "Legends of the Fortieth" was one of my favorite episodes of the season. The writing was so good, and the performances from the ensemble cast were strong. I couldn't get enough of Louis's excitement for his birthday with Eddie, Emery, and Evan. And Jessica trying to figure out what to give and trying to find a way was just hilarious. Overall, I give this episode a 9.5/10. What did you think of the episodes? Leave a comment!